Tuesday, I attended our district Schlechty coaches workshop. C4DII (Coaching for Design level II) coaches practice coaching with a Schlechty Center associate. We also worked with teachers that wanted to begin the design process for engaging work. There were several teachers that attended that had some great lessons they wanted to take to the next level. 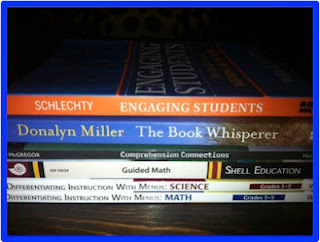 Today, I started reading my pile of "teacher" books. I started with Engaging Students...moved on to The Book Whisperer. Right now, I'm on page 126 of The Book Whisperer. This is an easy, engaging and makes you think read. I've dog-eared, highlighted and sticky noted all my favorite-make me think parts. I'm going to going to add those tomorrow.